How are BP in Guild RAID calculated? Note: These are results after a "Ranked Guild Raid"
- What is the rating system for Guild Raids?? - How are BP calculated?? - Why is it that killing more enemies doesn't place you on a higher rank than those that have killed less? Someone please help me understand what in the hell is going on here. What is the strategy to place well in guild raids? Last edited by LethalBunny; 12-29-2018, 08:54 PM. Just a guess, maybe Guild #3 started on 3 star difficulty and did not actually get to eliminate the boss, while Guild #5 started on 1-star, both guilds with probably 3-5 people on. Last edited by Cyntus; 12-29-2018, 05:21 PM. Thanks for the reply that's definitely helpful! - I wasn't aware we could change the "Ranked Guild Raid" Difficulties? I thought that was only possible for the practice ones? 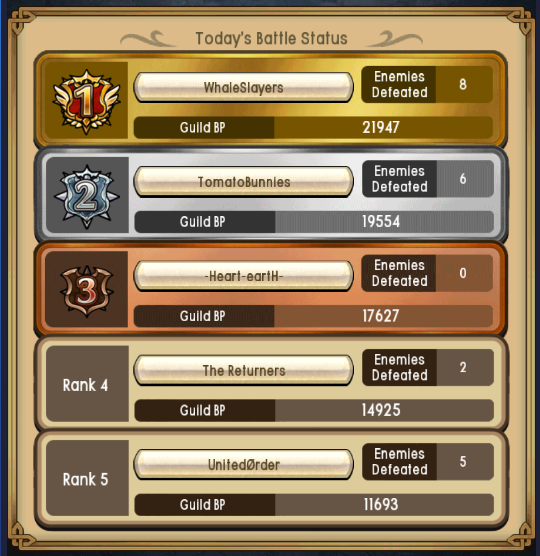 I should have clarified that the original screenshot is results of a "Ranked Guild Raid"
- Also what is a "Bonus Raid" and how does one get this? Last edited by LethalBunny; 12-29-2018, 08:55 PM. You can change RGR difficulties if you're a sub-leader or the guild leader through Strategy Settings (between 1, 2, or 3 stars, each ascending number is harder.) Do note that if you start on 1-star difficulty and clear that set, you will then move onto 2-star difficulty which will earn more BP and so on. Bonus raid can be selected on the same tab. You pick either 1st, 2nd, or 3rd raid to be your bonus. During this time, BP earned and time will be doubled (15 minutes).